Rainbow trout are a western North American species, native to the Pacific slope from California to Alaska but have since been widely introduced elsewere, even on different continents. Hatchery-reared fish are used in many places that don't have enviroments quite right for sustainable reproduction but do support live rainbow trout. The golden rainbow trout is a pale goldish rainbow trout raised as a novelty for fisherman. The golden rainbow is not a cross between a rainbow trout and another species. 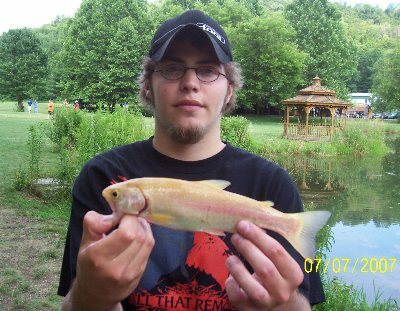 A female trout with a genetic mutation that gave her a pale golden color was caught and through selective breeding with regular look rainbow trout, a golden rainbow trout was developed. This is akin to a breed in dogs.